1984 presidential election results. 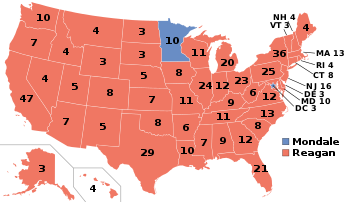 Red denotes states won by Reagan, blue denotes states won by Mondale. Numbers indicate the electoral votes won by each candidate. The 1984 United States elections was held on November 6, and elected the members of the 99th United States Congress. The Republicans won a landslide victory in the presidential election, picked up seats in the House, and successfully defended their Senate majority. Republican incumbent President Ronald Reagan won re-election, defeating Democratic former Vice President Walter Mondale. Reagan won the popular vote by eighteen points, and carried every state except for Washington, D.C. and Mondale's home state of Minnesota. Mondale defeated Colorado Senator Gary Hart and Reverend Jesse Jackson of Illinois to take the Democratic nomination. Mondale selected New York Congresswoman Geraldine Ferraro as his running mate, making Ferraro the first woman to appear on a major party presidential ticket. In the House, the Republicans picked up sixteen seats but remained far from compiling a majority. The Democrats picked up two Senate seats, bringing their total to 47 (out of 100) seats. In the gubernatorial elections, the Republicans won a net of one seat. ^ "Statistics of the Presidential and Congressional Election of November 6, 1984" (PDF). U.S. House of Reps, Office of the Clerk. Retrieved 10 April 2017. ^ "1984 Presidential Election". The American Presidency Project. Retrieved 13 August 2011. This page was last edited on 3 December 2018, at 19:02 (UTC).